Size 6-18 months. First bedding. Size 6 to 18 months. Need to rent a dreampod in Paris for more than 1 month? Contact us for a specific quote. To travel with baby but still have your little one sleeping comfortably and safely installed, you've decided to rent a cot in Paris, delivered to your holidays place. This soft dreampod will allow 6 to 18 months baby to be warm wherever your stay, together with his new friend Mr Hadgehog and to the parents to travel even lighter. Simply because we are parents too and we know the many things we need to carry when travelling with baby. There's only one thing we cannot rent: your little one blankie. We'll deliver this dreampod directly to your place, together with your rented crib. 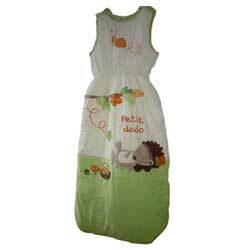 All our textile items are washed with washing powder suitable for babies and no softener. This product has been newly added to our range of baby equipment rentals (from a suggestion of one of our customer!). It has not been commented yet.